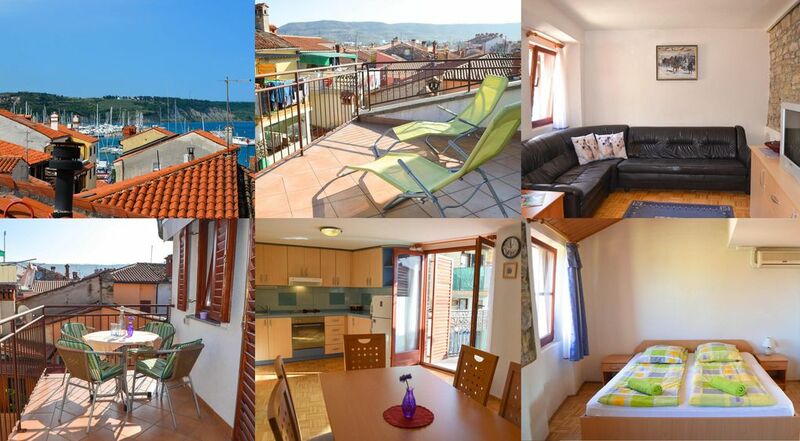 The two storey penthouse apartment offers guests comfortable accommodation in the center of the historical Mediterranean old town, just a step away from the social life, cultural events, or the beach. WiFi, AC & parking included. The seaview apartment has lots of space. It has a big master bedroom with double bed, and a second bedroom on the upper floor with two double beds (with low ceiling). The living room has a big sitting area, dining area, and big, fully equipped kitchen, and it connects to the balcony. There is a spacious private rooftop terrace accessible by stairs, from where you can have great views around the city and the sea. Apartment is equipped with air-condition, basic Wi-Fi, and all the linen and towels are provided. Bathroom is equipped with a walk-in shower, sink, toilet and washing machine. Baby cot/crib can be arranged if available and if requested in advance. If you come by car, we can arrange you a parking permit free of charge, with which you can park on one of the streets in the center near the apartment (less than 5 minutes walk). If you come by car, we can arrange you a parking permit free of charge, with which you can park on one of the streets in the centre near the apartment (less than 5 minutes walk). Fully equipped kitchen is equipped with cooker and refrigerator, owen, basic utensils, dishes, tableware and gadgets. Please mind no parties are allowed in the house. The apartment is in a dense residential area, that's why no excessive noise is permitted. Thank you for understanding! If you come by car, we can arrange for you a parking permit free of charge, with which you can park on one of the streets in the center near apartment (less than 5 minutes walk).